Dutch Filtration specialises in the design and in-house manufacturing of filter equipment and consumables for oilfield and oil and gas applications. The company offers a range of design and implementation services, providing filter systems for the clean-up and removal of completion and workover fluids, wastewater and slopwater as well as well stimulation and acid flow-back residue. We also supply solutions related to well testing, produced-water treatment, pipeline flushing and cooling-water intake. Our products are carefully designed to meet the highest Health and Safety Environmental standards. Oilfield brine filtration is used to prevent contamination of the formation site, and prolong the serviceability of down-hole tools prone to deterioration. During long-term operations, dirt and debris particles can build-up in the formation and form a plug-like seal, which reduces efficiency of oil and gas production, and risks shortening the lifetime of the producing well. This harmful process has also been known to occur during clean-up operations, as well as perforating, fracturing and workover, acidising, water injection and even gravel packing. In fact, any time fluid is introduced into a well bore with a solid content there is a chance of damaging the formation, no matter how brief the exposure time or seemingly insignificant the amount. Dutch Filtration has more than 20 years’ experience in dealing with such contamination scenarios, and remains committed to providing the equipment and filter consumables you need to make the filtration process as hassle-free as possible. There’s never been a better time to partner with Dutch Filtration, as our range of efficient and innovative equipment has recently been re-launched with an advanced line of all-new products, including a 600ft²-1,500ft² filter press and 400ft²-1,600ft² vertical pressure leaf (VPL). Other original products now on offer are our dual vessel cartridge filter unit, dual vessel bag filter unit , dual combination bag/cartridge filter unit,, diesel and electric-driven centrifugal pump skids, mixing slurry skids (available in dual, single and stackable versions), polymer shearing devices and absolute pleated and nominal-rated wound filter unit cartridges. We are also able to supply a number of high-quality hoses, hose baskets and DE-media. Water-flooding, or injection, is the term given to the process of manually pumping liquid into the reservoir, a procedure to increase environmental pressure and stimulate production. Filtration is required during water-flooding activities to carefully control, and ultimately maximize, the flow of solid-free and deaerated water into the formation. Dutch Filtration design purpose-built systems to serve a number of water sources, including sea and river water, as well as produced and aquifer varieties. Our robust line of products for water injection processes features coarse automatic self-cleaning filters, in addition to high-pressure well-head, multi-media and fine filtration cartridge filters, as well as manual strainers. Dutch Filtration’s simple and effective solutions for wastewater treatment can be easily applied at drilling and production sites, both on land and offshore. Our powerful equipment, with or without filter consumables, will treat large volumes of water contaminated with (emulsified) oil and solids, down to discharge levels of less than 5ppm if required. We provide an all-encompassing catalogue of machinery for wastewater disposal purposes, ranging from dual-vessel filter units, hydro cyclones and flotation devices, to filter presses, VPLs, oil absorption cartridges and other related media. Our new Dual Vessel Cartridge Filter Unit has been developed from decades of experience in manufacturing oilfield equipment and customer feedback in mind. The dual-pod filter (or twin vessel) is especially designed for the safe, efficient and effortless filtration of oilfield fluids. Our unit has unique features, such as Rudi Quick Opening Closure, a safety railing constructed to Mobile Offshore Drilling Unit (MODU) specifications, as well as easy accessible manifold and more. The filter unit is designed and built in accordance with DNV 2.7-1 standards and is certified by DNV. Our standard DFC24 has two vessels (PED MOD A for all type of fluids), both of which are equipped with 50 cartridges and six valves for parallel, in-series and by-pass operation. All wetted parts are marine-grade SAE 316 stainless steel. Dutch Filtration has devised a unique and robust quick opening-closure for all its cartridge and bag filter housing specifically to address the needs and requirements of the oilfield industry. The pressure vessel closure system is designed for swift, safe, ergonomic and leak free-change out of filter cartridges or bags. Our Rudi QOC has many benefits over the traditional swing-bolt closures such as the lack of loose parts, a two-hand safe operation, and a lid that opens in just a few seconds. The Rudi QOC is rapid, reliable and easy to use, as well as being 100% sealing and requiring no tools for application. All common elements are stocked in our warehouse, based in the Netherlands. 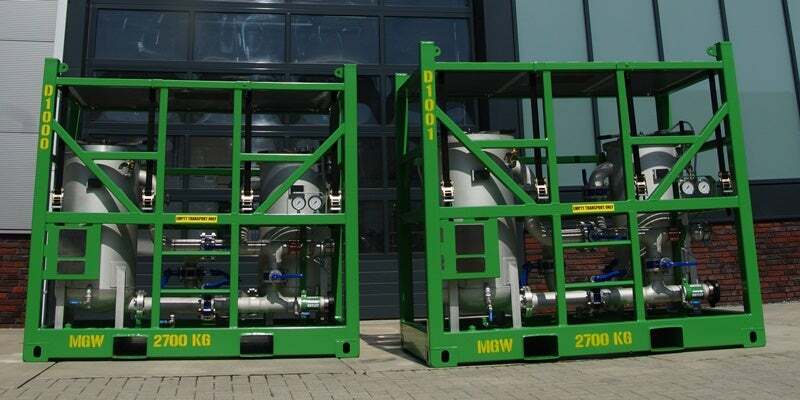 Dutch Filtration offers clients a complete range of filter equipment for rental. We are also happy to provide onsite commissioning, training and troubleshooting upon customer requests, for both land and offshore locations. Dutch Filtration's extensive catalogue of dual vessel cartridges and bag filter units are fully certified to PED 2014/68/EU for fluid group Cat 1, module A CE. Dutch Filtration specialises in the design and supply of innovative filter solutions for use in offshore environments. A video demonstrating Dutch Filtration’s Rudi QOC rapid open-closure system, for use with cartridge and bag filter housing within the oilfield industry.